From 1903 to 1905, the New York Herald ran a series of original comic strips called The Upside Downs of Little Lady Lovekins and Old Man Muffaroo. This comic strip, created by cartoonist and illustrator Gustave Verbeek, consisted of a total of 6 drawn panels. After reading the 6 panels right-side-up, the entire comic could be turned upside down to reveal an additional 6 panels that continued the story (bringing each comic to a total of 12 panels). That Gustave Verbeek completed a total of 64 such upside down comic strips over a two year time period is a testament to his creativity and resourcefulness. 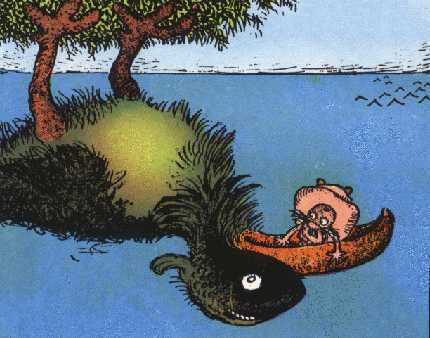 Perhaps the most famous image from The Upside Downs of Little Lady Lovekins and Old Man Muffaroo is one that shows Old Man Muffaroo in a canoe being attacked by a fish. Continue reading this post to view how this image looks when inverted. 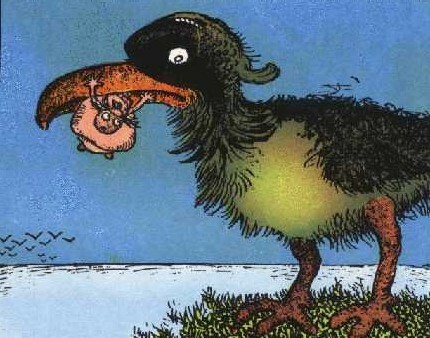 When turned upside down, the image turns into one of Little Lady Lovekins stuck in the beak of a giant bird.